If you’re in the materials, warehousing or stock-handling industry, you’ll have heard of Jungheinrich, in the same way that most have heard of Mercedes-Benz. You might never have sat in one, but you know that they are a high-quality, hi-tech, big-ticket item that has a long pedigree, does the biz consummately and often out-lives models from rival makers. The company began as a materials handling equipment producer but has grown to provide manufacturing logistics services too. Here in Australia, the Jungheinrich brand is handled by NTP Forklifts, with main offices in Melbourne, Sydney, Brisbane and Adelaide. It offers more than 600 different goods-handling devices — and they’re all bright yellow. Sitting at the top of the pile is the all-new EFG550S, a machine that advances the current electric counterbalanced forklifts by a significant degree. Now a fully-electric vehicle, it can lift a solid 5 tonnes and new technology gives unrivalled efficiency in terms of energy consumption and recharge rates. Launched last year in Europe, but new on the Aussie market, this machine is already being held up as a new benchmark in the industry. Besides a high-capacity, slow-discharge, rapid-charge 80-volt battery and regenerative braking, Jungheinrich equips the new premier model with an easy-to-use battery changing system that allows for the quick and safe removal of the battery. It uses SnapFit adaptors that provide a uniform battery changing system for all Jungheinrich electric counterbalance trucks, from 48V to 80V. A standard Jungheinrich low-platform stacker can be used to remove and replace the battery if required; Jungheinrich suggests a fully-charged battery will cover two normal working shifts — and the battery will reach maximum charge in less than a third; in other words, it’ll run for the day and afternoon shift and charge up fully overnight, ready for the next morning. "High-frequency actuation of our three-phase AC motors results in extremely high efficiency standards for these trucks," according to Head of Product Management for Counterbalanced Trucks at Jungheinrich, Stefan Pfetsch. In tests, the makers claim the new model uses up to 20 per cent less energy than comparable rival models. 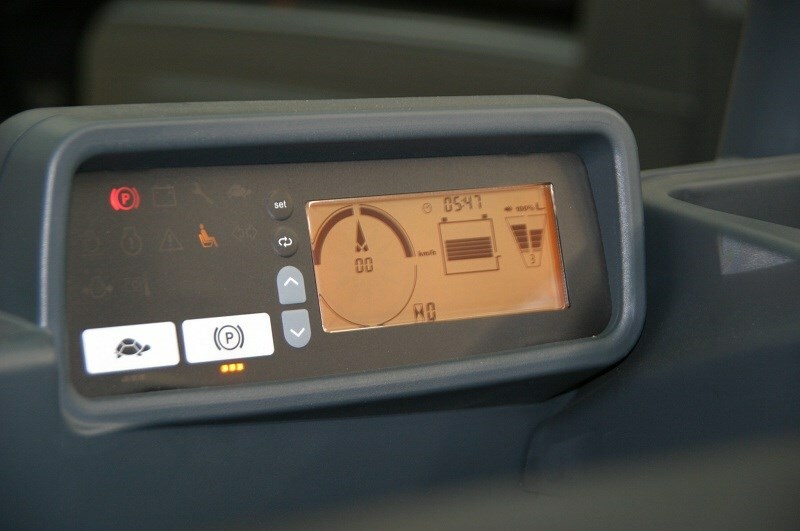 Five different programs of variable travel and lift speeds from the ‘Efficiency and Drive & Lift Plus’ modules offer operators the means to match the truck’s performance to the task at-hand; Jungheinrich will say that the new Series 5 stackers consume "as little energy as possible, yet as much as necessary". The EFG550 also has electrically assisted steering, which changes the steering’s behaviour, based on which of the five operating programs is selected. The ‘Curve Control’ system reduces speed automatically when a turn is initiated. In addition, the new ‘S Line’ models are fitted with larger tyres and an extra heavy-duty steering axle designed for outdoor use. Operating maintenance is kept to a minimum — besides plugging in the charger at the end of the day, there’s little on the daily chore-list: the three-phase AC motors, transmission and brakes are all built into the drive axle, the machine boasts lifetime lubrication of major parts, and sealed wet disc brakes keep working, irrespective of the operating environment. 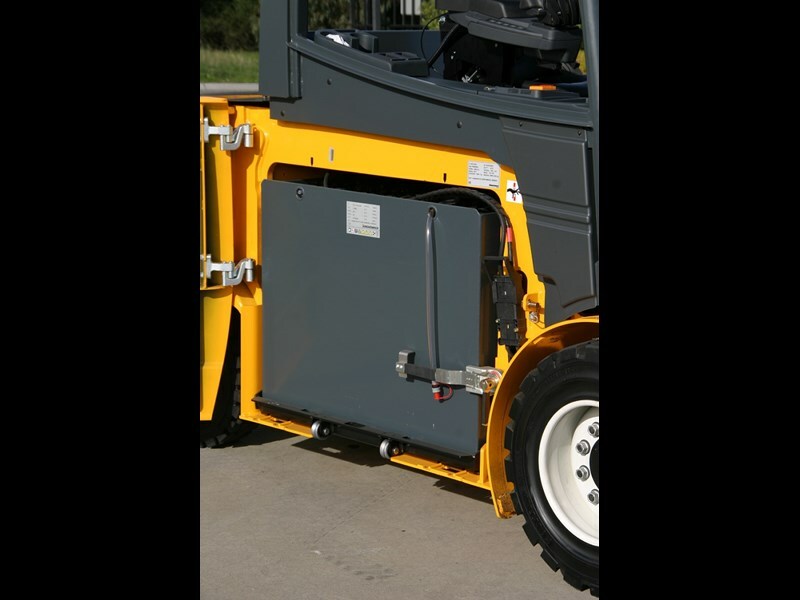 Safety is boosted with an auto-engaging parking brake that works on flat and sloping surfaces and eliminates roll-backs, plus the complete shutdown of all hydraulic systems, if the operator’s seat isn’t occupied. In addition, if activated, the ‘Access Control’ system will only permit the vehicle to be driven if a valid PIN is entered, the seat is occupied and the safety belt is engaged. Careful design of the mast channels and hoses maximises forward view, whether the load is millimetres off the ground, or at the optional 7,180mm maximum. With the new machine’s long-shift capability, designers paid even more attention to operator comfort and safety, fitting an adjustable tilting steering column, a wide flat floor with large access steps, a full-suspension seat and floating cab and an ergonomic arm-rest with all major controls within easy reach to cut vibration and therefore, operator fatigue. Whether you’re a user-chooser or a rival, there’s no denying that the Jungheinrich EFG550S model advances the art and science of electric forklifting by a significant degree and raises the bar — all the way up to 7.180m. Find Jungheinrich forklifts for sale. 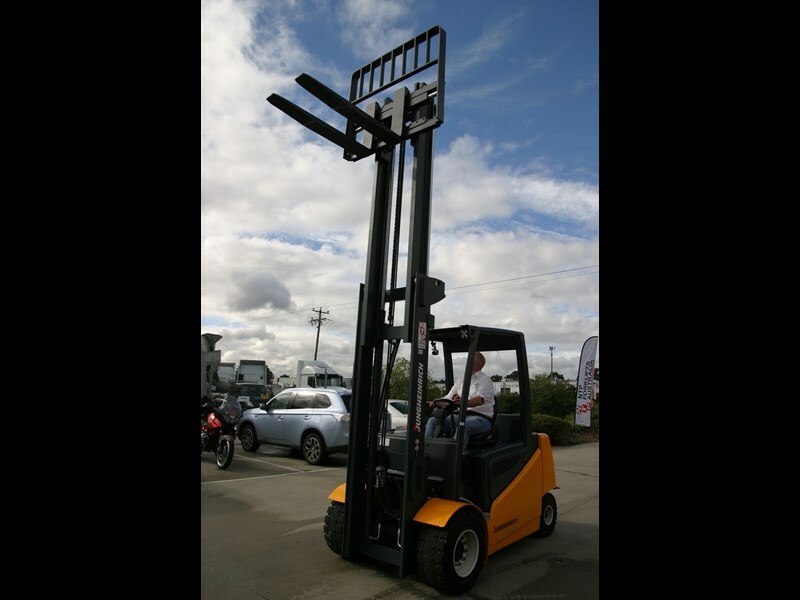 Look up Jungheinrich forklift specifications. Jungheinrich aims to lift the bar with its new EFG550S electric forklift. 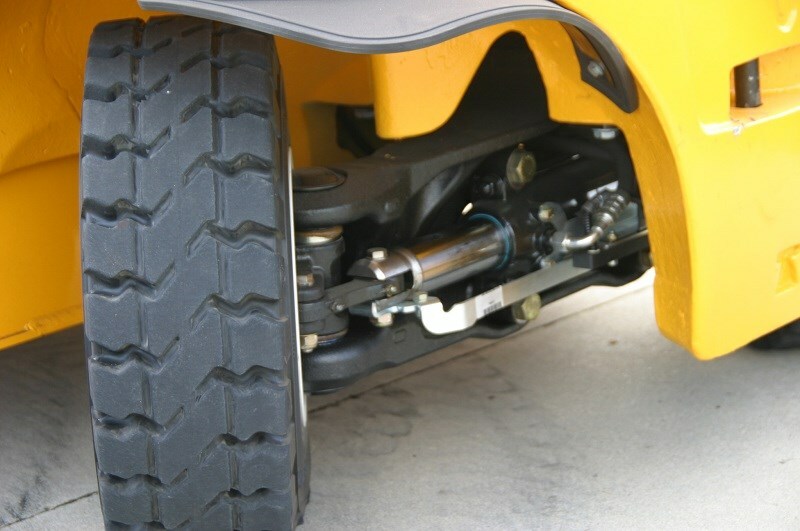 Heavy-duty steering rack permits a 2.45m turning radius — less than the vehicle’s length. The battery cover opens up through 180 degrees for ease of access; battery removal is aided by built-in rollers while in-situ charging is done with the on-board charge cable . A normal operating situation, displaying speed, selected mode, run-time, battery charge and mast level, even an empty seat.